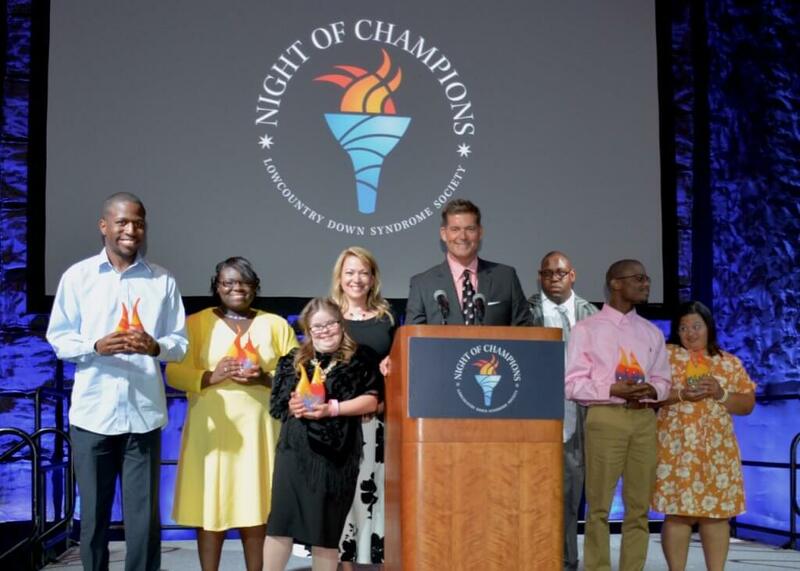 (SAVANNAH, GA) Six “Champions” and their employers were recognized at the Lowcountry Down Syndrome Society’s ninth annual Night of Champions held at the Savannah International Trade and Convention Center. This year’s theme was designated as “Legacy” to call on the community to design a legacy for the inclusion of differently-abled people. Night of Champions recognized local businesses that hire and retain differently-abled people, including those with Down syndrome, and the contributions made by these employees who are designated as Champions. Tukes, a greeter and custodian at Pooler Karate, is always on time and ready to give students a fist bump. Before students arrive, Tukes waters the plants, cleans the windows and helps with anything needed to prepare for the day before he takes his place to open the door for customers with his ever-present smile. Fellow employees have commented that it makes them feel cared about when Tukes asks them about their well-being. His positive presence also has provided insight into caring for children with different abilities who take lessons at the studio. Hudson is a kitchen assistant at Back in The Day Bakery, and his supervisor has nick-named him Herbie the Lovebug for the compassion he shows for his fellow employees as he works to keep the kitchen running smoothly. Brown, a courtesy clerk at Kroger, is known for her integrity, respect and incredible diligence. She lives in her own apartment, maintains a healthy lifestyle and rides her tricycle to work. Brown stays busy swimming, bowling, weight-lifting and staying involved on Tybee Island through activities with The Coastal Mermaid & Pirate Club. Smith is a utility and kitchen assistant at SCAD’s Byte Café, a branch of Bon Appetit Catering. He works to keep the café clean and well stocked, is known as one of its hardest workers and has impressed his supervisors with his willingness to take on new challenges. He helps train new employees and has come out of his shell, befriending not only co-workers but also SCAD students and staff. Weathers is a file clerk who has done so well that Grainger Honda and Nissan have hired six more individuals with different abilities. Weathers is known as a day-brightener whose fellow employees enjoy the days she sings while she works. Campbell works in guest services at Zaxby’s in Beaufort, S.C., where she delivers orders, cleans the restaurant and greets customers, making every customer feel valued as she asks about their days. Campbell says her day is always perfect. A special recognition called “Message in Motion,” awarded to employers who have attended Night of Champions in the past and were motivated by the event to hire differently-abled employees, was given to Carson Fortner of Pooler Karate for the opportunity he has given Jabari Tukes. Sara Hart Weir, the president and CEO of the National Down Syndrome Society (NDSS), and Kandi Pickard, first vice president of NDSS, attended the event. Celebrity chef and author Jamie Deen served as the emcee alongside Allyson Harvin. The 2018 Night of Champions was sponsored by Lowcountry Down Syndrome Society, the Savannah International Trade & Convention Center, Marchese Construction, Matson, and Coastal Electric of Georgia.